Ever since we produced the PYRO-ENERGEN electrostatic therapy device for the treatment of viral and incurable diseases, thousands of inquiries and comments, both pros and cons came to us. Some of them want to know if the world's famous Van de Graaff generator works for the same purpose. Yes, it may work if you use it in a short period of time. Why? Because most Van de Graaff generators produce static charge that is positive (+) in polarity, NOT negative (–). This can lead to health problems, because many research have proven that positive static electricity affects human bodies and causes headache, high blood pressure, cancer, and many other discomforts. Why Is Positive Static Electricity Harmful To Our Health? In a positive electrostatic environment, the amount of positive ions (cations) in the air is so high that the positive ions in our body also increase. As a result, our body will fail to undergo metabolism, and thus our cells become weak and we will be easily affected by illnesses and the aging process will accelerate. As you can see in our current modern lifestyle, our body is exposed to positive ions generated by cell phones, ultraviolet rays, acid rain, chemicals, electronic equipments, and computers. Conversely, grasslands, forests, and tress, are high in negative ions, especially in waterfall areas, which is why these places are known to be the best environment for health. If you can reverse the polarity, then, you will have no problems at all. That's easy, isn't it? Does this answer satisfy your question? Remember during your school days in science or physics class where you used to experiment with static electricity, rubbing glass rod with silk cloth or some PVC with wool? If an atom has more electrons than protons, it is negatively charged. If an atom has more protons than electrons, then it is positively charged. If a material is more likely to capture electrons when in contact with another material, it is more negative. 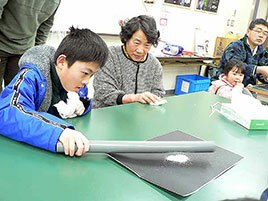 Probably, you can find materials below that produce static electricity by rubbing. The human body is positive. Fur, glass, nylon, wool, silk, and cotton, are considered to have a positive charge. Materials such as polyurethane, saran, styrene (Styrofoam), polyester, PVC, and Teflon, are negatively charged. To know if rubbing the PVC with wool or paper is producing static electricity, bring your AM radio near the PVC pipe when rubbing. The radio will produce whirring noise. Also, if you bring your finger near the PVC pipe, it will produce arcing sounds. If it's done in a dark place, you will see sparking blue light. If you bring the PVC pipe near the small pieces of plastic, paper, or balloon, it will fly away. Negative (–) charges collect on the surface of the PVC pipe. Static electricity is the buildup of electrical charges on the surface of some materials. Static electricity is usually created when materials are rubbed together, causing positive charges to collect on one material and negative charges on the other surface. Static electricity may show spark, shock, or arcing sounds. “Static” has no current flowing, unlike AC (alternating current) and DC (direct current). Static electricity is formed easily when the air is dry or the humidity is low. When the air is humid, water molecules can collect on the surface of various materials, and will prevent the buildup of electrical charges. Static electricity is essential to all living things like plants as well as human being. However, we lose natural static effects in modern world because of various circumstances such as pollutants, stress, and toxic environments. If we could maintain reasonable static effects that surround us, there shall be no incurable maladies in the world. Suppose you can rub a PVC pipe one hundred times a day, and discharge it with your fingertip every day, you can certainly maintain your health in its best condition. But who have such tiresome hours every day in this busy world? It's just impractical to do. However, more than 40 years ago, we had tried and requested sickly elderly patients to do it. Amazingly, we had observed remarkable results out of it—many sickly people got well. To make it simple, we constructed an electrostatic therapy device called the PYRO-ENERGEN. If you do not want to spend for the machine, then, do the PVC rubbing above—it will only cost you a few cents. To test your PYRO-ENERGEN machine, you can place a PVC pipe 1–2 inches in diameter and about 1 1/2 feet length on the mesh net or metal plate of the PYRO-ENERGEN for about two minutes. 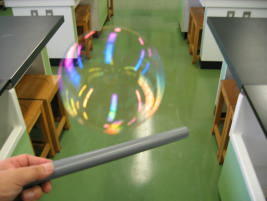 Then, a piece of tissue paper on the plastic table can be lifted or played with balloon like the photos above. Also read article “PYRO-ENERGEN and Static Electricity”.